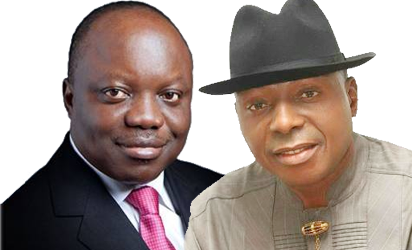 Few of the 109 Senate battles on Saturday would be as watched as the battle in Delta between two former allies, colleagues and party men, Dr. Emmanuel Uduaghan, the immediate past governor of Delta State and Senator James Manager. The contest for the Delta South Senate seat turned into an anti-climax in 2015 when Dr. Uduaghan as the incumbent governor of Delta State withdrew from the Peoples Democratic Party, PDP Senate primaries after a famous falling apart between the two men. Dr. Uduaghan’s bid to claim the Senate seat was firmly rebuffed by Senator Manager who upon then proceeded for a fourth straight term in the Senate. Dr. Uduaghan last year defected from the PDP, the party he belonged to for 18 years and on whose platform he served as governor for eight years, secretary to the state government, commissioner among others. Senator Manager on his part traces his political beginnings to the Third Republic where he served as state commissioner for sports and was the foundation chairman of the PDP in Delta State. What has been your message to the people in your campaign? I have packaged my message in my campaign manifesto. We have issues to address in Niger Delta and Delta South Senatorial District is like nucleus of the Niger Delta. Delta South in terms of economic base, has the largest quantity of crude oil in the Niger Delta. Some of the crises in the region have histories that have to do with Delta South; I was involved in the management of these crises at various levels while in office. My strategy for managing these issues as governor of the state then was engagement by the state and enforcement; law and order on the part of federal government. There was respite because of that but I do not think the respite is sustainable. We need to do something more so that the Niger Delta will be less problematic to manage. Right now, the Delta South voice in Abuja, to me, is not audible enough, not heard as much as necessary; people need to know that there is a Delta South in Nigeria. Not Delta South that is involved in violence, not Delta South that is involved in crime, but Delta South that is speaking for Delta South and by extension the people of Niger Delta. That has been campaign message to people. Your major opponent, Sen. James Manager, has been in the Senate for 16 years, now going, how do you intend to dislodge him? I do not know why you used the word “dislodge”. Rather, I am vying for it and I want to sit on that seat. How I am going to do it? It is by bringing issues to the table and I am already bringing them to the table. My campaign is issue-based and not person-based, not even ethnic-based. It is about what are the issues affecting us. I have the capacity, I have the knowledge, I have the reach and I have the experience because I have been there and that is why I am presenting myself for the race. Let me tell you, my mission to the Senate will be focused on four pillars, which I call the JEW+P (Jobs, Empowerment, Wealth plus Peace). As a former Secretary to the Delta State Government and a former two-term governor of the state, I know and understand the pains and needs of the people. There were things I wanted to do to open up opportunities and bring economic development to the people, but I could not do because I was constrained by the laws of the country. This was what fired my desire to represent the people at the Senate. There is this claim that the PDP your former party has been rigging elections in the state. That is a party on which platform you were governor of the state for eight years. Your victories -were they achieved through rigging? Not at all and it could not have been. In fact, after elections, there were usually tribunals. Overall, they took me to tribunals and there were about 19 tribunal cases. I passed through 77 judges. That is why I have written a book about my electoral cases. If my elections were rigged, I would not have been in office for eight years. There was a time the judges said that I should go and re-contest. The basis for that was that at the time there was confusion in the judiciary. The plaintiff said I rigged and the court said I should prove I did not rig. However, my lawyers did not prove that I did not rig and because of that, the court said I should leave office. Nevertheless, I am happy that the Supreme Court has corrected that. Apart from that, all the other cases I won and I do not know if the 77 judges would have been wrong. We have been hearing about a purported power sharing agreement in Delta South senatorial district, is it such a treaty? Let me say this; Nigeria is a multi-ethnic society and because of its multi-ethnic nature, there are ethnic groups with large populations and there are ones with small population. Over the years, people have been looking at how the ones with small population get power and how the ones with large population ensure that the small ones get power. They put different mechanisms in place, but as at today, I would not want to get involved in that debate. I will get involved when I have finished taken part in my election. From my experience, that is the way it should be. Now, I do not want anybody to drag me into the debate on power shift or power rotation. Senator James Manager is the incumbent Senator representing Delta South Senatorial District in the National Assembly. In this interview at his Warri residence, he spoke on February 16 National Assembly elections, his preparedness and much talked-about zoning arrangement. You have been in the campaigns gunning for your fifth term; what have been your staying power and your hopes on February 16? As representative of the people of Delta South, I have tried to serve the people diligently with their interest uppermost in my heart. I do only those things that make them feel happy. People expect a lawmaker to do extraordinary things, influence so many things physically to your own people. Therefore, at my level I have been able to do that. I may not have done it to the maximum satisfaction of people but on the average, I think so far so good, I am giving my people good representation. That is the reason I am still serving. Sir, what has been your message to the people in your campaign? My campaign is about continuity. Just allow me to continue to serve. By that, I mean I have been on the seat and I participated in almost everything. I have also influenced quite a number of things and I want to believe that the people of Delta South believe in me that my continuity will bring more dividends of democracy to them. I cannot say what I have done so far has satisfied a hundred percent of my people. My constituents are so articulate and intelligent and so if I were not doing well, they would have definitely rejected me long ago. Even within the PDP, I passed through a very turbulent test; I mean the party primaries, not just the recent one but all the other ones that have come and gone. We have put in place mechanisms in the party where the most popular person is always projected and that I passed through. It is not as if I disqualified the other people and emerged as a candidate. Now, the judgment of the people of Delta South I am relying on, and that judgment by the grace of God will be very wonderful. Some of your lead contenders from the Itsekiri axis insist that it is their turn to produce the next Senator on February 16; what is your take on that? Yes, because of the clamour for rotation, I promised that beyond this 2019 election, by the grace of God I will provide the platform where the ethnic nationalities will assemble for an all-round discussion and that discussion will be the first of its kind. I have been contesting with people from everywhere. Even when I contested in 2003, I contested with people from everywhere. Nobody zoned it to a particular ethnic group. I have been contesting with people, not just party primaries, not just main elections, election tribunals but also post-election matters. Most of them went up to the Supreme Court. So, as I sit down here talking to you, I cannot remember at any point in time when it was zoned to me or zoned to one particular ethnic group where only people from that ethnic group contested and I won. However, because of the clamour that it has to rotate, and for us to have peace, I will provide the platform, God willing if I win. That clamour is coming for the first time as far as I am concerned. If anybody remembered at any time that people sat down, discussed and agreed that it must be the turn of this ethnic group or that. We need to grow beyond this ethnicity thing. When my very good friend, colleague and ally, Dr Emmanuel Uduaghan, wanted to be governor of Delta State, the entire Delta South came together and there was nothing like ethnicity; ethnicity was not an issue and he got bulk of the votes. I want to put on record that I have never at any point in time done anything to undermine any ethnic group I represent in my sojourn in the Senate, to God be the glory. Are you worried by the threat of federal might? Well, elections have been taking place in this country and not just this one. So, I don’t know whether something different will happen, because I also hear people boasting that results will be pre-written and announcements will be made contrary to the voting pattern. The boasting is there and we are watching, we are waiting, but I do not want to believe it, though the rumors are very strong. I am very confident as we speak. The people peddling those rumors have their reasons for doing so but I am very confident going by what is on ground. I am the candidate to beat and people will be surprised if the contrary be the case because we are talking about Delta South Senatorial District. The story cannot be different in my humble view and it is difficult to see it otherwise. Sir, people see the race between you and former Governor Emmanuel Uduaghan as an epic battle; how do you see it and how do you want to tackle him? Dr Emmanuel Uduaghan is the immediate past governor of Delta State and that makes it very significant. Not only immediate past governor, he was a PDP man. He benefited for clearly 16 years under the PDP. The people under the PDP elected him governor three times. He was a PDP man until very recently and therefore people are bound to have that feeling that it is an epic battle. I do not see any epic battle. The man himself knows that there is no epic battle here because the APC is not on ground. Do not forget, in 2015 APC in Delta State did not even take second and their worst results came from Delta South. Therefore, it is just in news, beyond the news there is no epic battle. APC is yet to register itself in the minds of Delta Southerners.